We all know that the strike zone isn’t always called correctly, and we all know that the mistakes aren’t just randomly distributed. Have you ever stopped to think about how weird that is? The zone is at the core of the entire game, and for as long as baseball has existed, some teams have gotten more generous zones than others. It’s like if some football teams only needed to gain nine and a half yards for a first down. It’s like if a hockey team, or a basketball team, or a soccer team got to shoot at a slightly larger goal. These adjustments wouldn’t make all the difference, but they would make a difference, and they’d be weird, too. Inequality is weird. On the other hand, it’s not like the other sports don’t have their own areas of subjectivity. Football penalties. Hockey penalties. Basketball fouls. Soccer fouls. Fouls, basically. Those might not be randomly distributed, either. I don’t know enough about that research, but thankfully, I’m about at the end of this introduction, so we can get back to the baseball stuff. Known fact: not all strike zones are called the same. Question: so how have teams benefited or been hurt by the strike zones this year? This is one of those posts of mine I re-visit every few months, and this is one of those posts of mine that could just about only be a table. I don’t need to provide that many words because the numbers all but speak for themselves. What I’m going to show you are extra strikes, above or below average, per team. I’m combining the numbers for pitchers and hitters, because while we’ve talked countless times about why pitchers get different zones, hitters are involved, too. For every ball that’s framed well, or for every strike that’s lost to a wiggly glove, there’s a hitter in the box. It all counts. As usual, I’ve calculated the numbers using data available on FanGraphs. 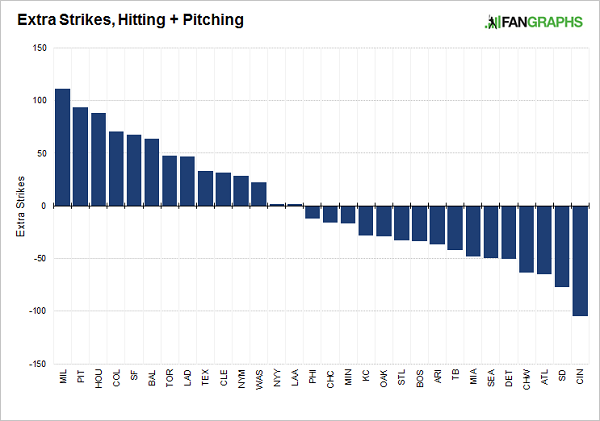 For pitchers, I looked at strikes – expected strikes. For hitters, I looked at expected strikes – strikes, so that a positive number for either indicates a team benefit. This is not the best way to do the analysis; the best way would look at every pitch individually, and then go from there. But this has the advantage of being tremendously easy, and I’m always fond of what’s easy. I don’t think very much is lost. This might get us 90 – 95% of the way there, and that’s fine. By this analysis, the Brewers, so far, have worked with the most generous strike zone in baseball. They show up at +111, meaning they’ve benefited from 111 calls more than average. Behind them, you see the Pirates at +94, and then there are the Astros at +88. There’s a drop-off between third and fourth place. Look at the other side, and, say, here’s another area where the Reds don’t look good. They’re last, at -105; the Padres are second-to-last, at -77. There are three straight really bad teams down there, but then there are also the White Sox. That’s a good reminder that I should break this down. Here’s a table of the team results, showing the pitching benefits and the hitting benefits, separately. This isn’t real surprising, but when I’ve looked at this before, I’ve found that the pitching benefit is a lot “stickier” than the hitting benefit. That is, the hitting benefit is more random, in need of heavy, heavy regression when projecting the future. The pitching benefit indicates more of a team skill, presumably because it leans on catcher framing. The Pirates have the biggest pitching benefit in here, followed by the Yankees, and the Yankees are notable because their hitting benefit almost entirely cancels the pitching benefit out. The White Sox have given away easily the most strikes when pitching, and that’s been partially negated by some good hitting fortune. The same could be said for the A’s. The Nationals and Indians have more positive hitting benefits than negative pitching benefits, and that’s helped while simultaneously not boding well for the remainder. You can look at whichever points you want — I don’t need to tell you about the entire table in words. And again, the method here isn’t perfect, and I just prefer it for its simplicity. But as long as I’m at it, I can tell you about a few individual players. The pitcher with the most generous strike zone has been Jon Niese, who’s at +35 strikes. That’s that Pirates effect, and Niese just edges out Jon Lester and Madison Bumgarner. The worst strike zone has belonged to Rich Hill, who’s followed by Carlos Rodon. There are pretty easily explainable reasons for each. On the hitting side, Bryce Harper shows up with the greatest benefit, followed by Jose Altuve and Adrian Gonzalez. On the other hand, Didi Gregorius has worked with a particularly cruel zone, as have Alcides Escobar and Matt Holliday. To repeat myself, the hitting numbers appear to be a good deal more random, but for some players they might not be completely random. And regardless, what’s happened has happened, and every strike turned into a ball has been helpful. We’ll look at this again down the road, I’m sure. For now, we have the Brewers leading the league in a positive category. The Reds, meanwhile, have found another way to be in the basement. I guess you could applaud their consistency. We hoped you liked reading The Team With the Friendliest Strike Zone by Jeff Sullivan! Good stuff. Would you be able to make the table sortable?